Days after taking office, Virginia Gov. Terry McAuliffe asked lawmakers to help him "show the partisans in Washington'' that Democrats and Republicans can find common ground. But in a Monday evening speech to the General Assembly, the new Democratic governor also pressed lawmakers on what is set to be one of the most contentious issues of the 2014 legislative session: expanding Medicaid. McAuliffe said the state can't afford to forgo $2.1 billion a year in federal funds by not expanding the Medicaid under the federal health care law to about 400,000 Virginians. "This money represents tax payments that Virginians have sent -- and will continue to send -- to Washington regardless of whether we seize this opportunity or not," McAuliffe said. He also noted that business groups back the expansion of the program, which is designed to provide health care to the poor. McAuliffe noted that several other states have expanded Medicaid, including those led by conservative governors. Republicans have steadfastly rejected McAuliffe's overtures to expand Medicaid, saying the program needs reform and Virginia should not rely on the federal government's promises of future payments. House Majority Leader Kirk Cox of Colonial Heights said getting Medicaid expansion through the GOP-controlled House is unlikely. "I just don't see that happening,'' he said. The new governor also stressed the need to diversify the state's economy away from dependence on the federal government. He also called for improving workforce development and reforming standardized testing in public education. McAuliffe said he will ask legislators to spend an additional $5 million to help the expensive northern Virginia region compete for top tier public school teachers. McAuliffe also said he supports expanding pre-kindergarten programs and reforming the Standards of Learning tests. He said he got an earful from Virginians about the SOL tests on the campaign trail. People complained about over-testing students and suggested using essay tests to measure knowledge and cognitive reasoning. McAuliffe also indicated his support for a proposal to allow the children of undocumented immigrants who are Virginia residents to pay in-state tuition at public universities. On the environment, McAuliffe pledged to help clean up the Chesapeake Bay. McAuliffe also declared that the tolls are too high for drivers using Virginia's Midtown Tunnel Project linking Norfolk and Portsmouth. McAuliffe says he had directed Virginia's transportation secretary to present a revised tolling rate schedule to the Commonwealth Transportation Board on Wednesday. McAuliffe took the oath of office as Virginia's 72nd governor on Saturday, succeeding Republican Bob McDonnell. 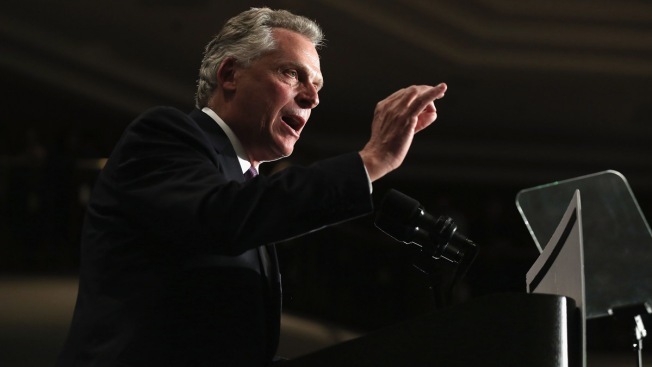 In his speech Monday, McAuliffe offered support for a bipartisan ethics reform plan hatched in the wake of a gift scandal that overshadowed McDonnell's final year in office. McAuliffe also said Virginia needs to enact a nonpartisan redistricting process. Winning office was a years-long effort by McAuliffe, who unsuccessfully sought his party's nomination in 2009. He spent the next four years touring Virginia and campaigning, then won his first elective office by narrowly defeating then Republican Attorney General Ken Cuccinelli in November. Overall, Cox said McAuliffe struck a positive tone on some issues - job creation and reforming the Standards of Learning tests, for example - but was short on specifics. "The proof is going to be in the details of what he actually proposes,'' Cox said.